Concentrated solar thermal power stations using steam turbines or compressed air turbines are less efficient than they could be. This video describes the difference between steam turbine power plants and gas turbine power plants. Concentrated solar thermal power plants use the same technology without using fossil fuels as the source of thermal energy. On the back end of the steam turbine the steam must be condensed back into water. During this condensation process, heat is “rejected” up cooling towers and into the atmosphere, resulting in a loss of 30% to 40% of the original heat energy supplied to the system. More energy is then used in pumping the condensed water back into the boiler at very high pressure. Compressed air turbines discard a large amount of energy collected in the exhaust flow out of turbine. More energy is used by the axial flow compressor that compresses air on input to the turbine. "Solutions" focus on methods to make use of the heat energy wasted by these engines. One often-used approach is to build an entire steam power station behind a compressed air turbine generator! This "solution" is known as a combined-cycle gas turbine or "CCGT" power plant. For reasons that are not clear solutions that simply avoid the waste of thermal energy in the first place are overlooked. Adding a high-efficiency compressor to the front of a conventional axial-flow air compressor and turbine generator allows the exhaust to cool to ambient temperature with no heat energy wasted. The Hicor technology achieves a more efficient compression process by minimizing the temperature rise associated with compression, improving efficiencies over conventional compressors by 30% or more. At its most basic, compression is a mechanism by which work is put into a fluid and results in an increase in pressure. Heat is also generated as a by-product of compression, which serves to make the process less efficient by turning some of the input work into heat instead of pressure. As the gas being compressed heats up further and further, the compression process gets less and less efficient. Hicor’s technology achieves a more efficient compression process by minimizing the temperature rise associated with compression, improving efficiencies over conventional compressors by 30% or more. Hicor’s proprietary compression technology provides a myriad of additional benefits as well, including fewer moving parts, less vibration and noise, and a variable pressure ratio. Finally, Hicor’s near-isothermal compression technology allows for compression ratios of 30 to 1 or higher, reducing system level complexity and resulting in lower capital and operating costs. The compression process can be displayed graphically, as in the pressure-volume (PV) plot shown below. The curves in a PV plot show how the pressure increases as volume decreases. For different compression processes, the curves will vary. The work of compression can be visualized as the area under the curve corresponding to a given compression curve. All compression processes fall between two extremes: adiabatic, where no heat is exchanged with the outside environment and the energy put into the system remains internal; and isothermal, where energy is removed from the system in the form of heat and the temperature of the gas remains constant. In practice, all compression processes fall somewhere between adiabatic and isothermal and are known as polytropic processes. To achieve a more highly efficient compression process, it is ideal to reduce the polytropic constant to as close to the isothermal process as possible, where the polytropic constant is 1. 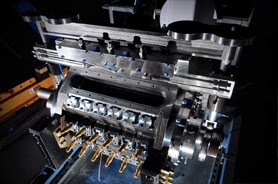 The Hicor proprietary compressor design is capable of achieving polytropic constants as low as 1.06, improving efficiencies over conventional, near-adiabatic compressors by as much as forty percent.